A Glenview lawyer sued Zillow, alleging that the real estate site's relatively modest estimate of her home's value has created a “roadblock” to selling at what she thinks it's worth. Zillow's estimate, known by the trade name “Zestimate,” is “effectively a sloppy computer-driven appraisal” of the value of her home, Barbara Andersen says in a complaint suit she filed late last week in Cook County Circuit Court. As of yesterday, her asking price was $626,000 for the three-bedroom townhouse, but Zillow's Zestimate was about $555,000. Andersen argues in her suit that although Zillow's site clearly explains that a Zestimate is not a professional appraisal, it meets the definition of an appraisal under Illinois law because it estimates the value of a home and is promoted as a tool that potential buyers can use to measure a home's value. “It gives the appearance to the public of being an appraisal,” Andersen said. Zillow, her complaint says, “should not be engaging in this business practice without a valid appraisal license and, further, the consent of the homeowner.” Illinois regulations say only a licensed appraiser can provide an appraisal. Zillow describes its method of creating a Zestimate as drawing on public records and a proprietary algorithm. On a page of its site that details the level of accuracy of its Zestimates, Zillow says its estimates on Chicago-area homes come within 5 percent of the eventual sale price 47 percent of the time. It comes within 20 percent of the sale price 86 percent of the time. Andersen said she believes the process is evaluating her property using records of homes built later and “more cheaply” than hers in a less appealing section of the Glen, the redeveloped former Glenview Naval Air Station. Andersen said that assessing her home against a different group of properties, which are larger and more expensive than hers but in the same section of the Glen, would generate a higher Zestimate. “Their computers aren't comparing apples to apples when they do a quick spin through the records,” Andersen said. 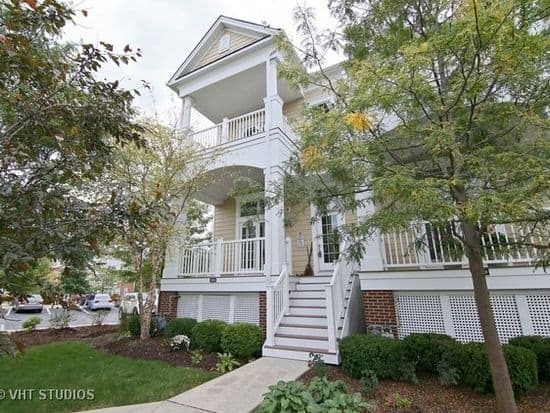 She bought the townhouse, which overlooks a golf course, for $628,500 in 2009, according to the Cook County recorder of deeds. She listed it for $670,000 in 2013, and again in 2014 for $720,000. Her price has come down $94,000 since then, to below her original purchase price. In her suit, Andersen argues that “Zillow's improper business practice has deterred potential buyers.” The complaint does not provide examples of buyers who have been turned off by the Zestimate.